What is Feline Gastroinstestinal Eosinophilic Sclerosing Fibroplasia (FGESF)? FGESF is a mysterious and underdiagnosed condition, often confused with other serious illnesses like Inflammatory Bowel Disease (IBD), lymphoma, and other forms of cancer. Being a very young diagnosis, not much is known about FGESF, especially in the United States. According to Dr. Michael Linton (BVSc, MANZCVS, Feline Medicine Registrar and researcher of FGESF in Australia), “FGESF can be looked as an uncontrolled inflammatory reaction in cats in response to a stimulus e.g. infection. What makes it unique is that it is characterized by the presence of distinct cells (eosinophils) and a large amount of fibrous tissue.” His 2015 study, Feline gastrointestinal eosinophilic sclerosing fibroplasia: 13 cases and review of an emerging clinical entity can be found here: https://www.ncbi.nlm.nih.gov/pubmed/25896239. Feline Eosinophilic Gastrointestinal Sclerosing Fibroplasia (FGESF) is a relatively newly discovered/identified entity. It can affect cats of any age and has been identified in both domestic and non-domestic felidae (it has been identified in pumas!). It is still too early to suggest a breed predisposition to FGESF although in Australia there appears to be an increased incidence in Ragdolls. Clinical signs are varied. In some animals, an abdominal lump is palpated incidentally during a routine healthy check, whereas some animals can be very unwell presenting with vomiting, diarrhea and weight loss. Some cats have presented for breathing difficulties owing to spread of disease into the chest cavity. Unfortunately, clinical signs when apparent are usually non-specific and therefore additional tests are required for a specific diagnosis. These tests usually involve abdominal imaging (often an ultrasound) and blood tests (there are a couple of footprints on the blood tests that may alert your veterinarian to the disease e.g. high eosinophil count). However, at this stage definitive diagnosis requires a biopsy and histopathology (staining the sample with special dyes and looking under a microscope for distinct changes e.g. increased fibrous tissue and increased eosinophil level). Treatment is fairly limited at the moment and largely reflects proposed underlying cause of the disease as well as the secondary problems caused by the disease. Specifically, antibiotics are often prescribed for at least 1-2 months. This is so because intralesion bacteria are present in at least 50% of cases. It is unclear whether these bacteria are a primary cause of disease or represent an opportunistic infection due to changes in the normal feline gastrointestinal architecture caused by the disease. Similarly anti-fungal and anti-protozoal therapy has been used when appropriate. If possible (usually varies depending lesion location) any gross “masses” can be removed or debulked with surgery especially if the lesion is large enough to cause an obstruction of the intestines. At this stage the mainstay of therapy is prednisolone. 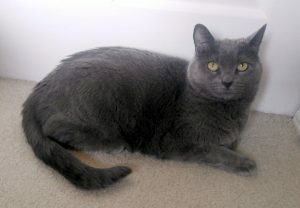 The reason is that it appears that these cats have a hyperactive immune response leading to fibrous tissue production. Prednisolone dampens this immune response eventually leading to shrinkage of the lesions. The reason for the hyperactive immune response is unknown. Genetic causes, inciting disease e.g. bacterial infection or a relationship to inflammatory bowel disease have all been speculated. In Australian ragdolls it is proposed that over grooming leading to ingestion of hairballs may irritate the gastrointestinal tract setting off the hyperactive immune response. Not consistent with this finding is that some cats have had disease in the surrounding lymph nodes (glands) with no identifiable gastrointestinal lesions. Some propose that if an inciting cause can be identified and appropriately treated then long term therapy (with prednisolone) may not be required. Prognosis is variable but seems to be improving as we learn more about the condition. Unfortunately, some of the early cases were misdiagnosed as aggressive cancers leading to premature euthanasia which may be skewing available data. In mid 2015, my kitty, Remy, who was 5 years old at the time was losing weight, not eating well (although he’s always been very finicky) and was throwing up often. I took him to the vet several times and his bloodwork kept coming back as perfect. I had no idea how to help him and was very concerned. 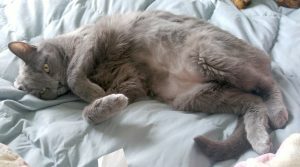 By November, he was so skinny and eating only treats and as a supplement, we were giving him GNC High Calorie Booster. I begged the doctor for help. In December of 2015, his vet decided to do an x-ray on Remy’s belly and saw a “thickening” of his stomach lining. This led to an ultrasound which confirmed the thickening. I was told that it was either IBD or Lymphoma but that I should bring him in right away for a surgical consult. The next day, we saw the surgeon who did an ultrasound guided biopsy and found a lesion (mass) and took samples of the mass, stomach lining and surrounding lymph nodes. 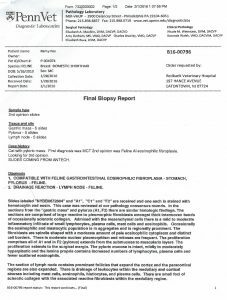 Results did not provide a specific diagnosis; however, there was no evidence of lymphoma. Our surgeon was still concerned that it was some form of cancer and that Remy needed surgery right away to survive. On December 19, 2015 a golf ball sized lesion located in his pylorus (the area where the stomach connects to the small intestine) was removed, along with 15% of his stomach, some small intestine and two lymph nodes. When he came home two days later, Remy was miserable and having a tough time. I took him to the ER on December 24th because he seemed to be in pain. They gave him more pain meds and did an ultrasound and bloodwork. Ultrasound was clear but bloodwork showed that Remy was anemic (likely from surgery) and that he had elevated eosinophils, which are a type of white blood cell. 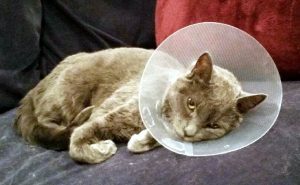 The biopsy results came back on December 29th and indicated a very aggressive form of mast cell cancer which I was advised was very unusual in the GI tract of cats. The surgeon did not feel optimistic about Remy’s prognosis and advised that we see an oncologist right away. The next day, Remy met with the oncologist who recommended we start chemotherapy (CCNU) and steroids (prednisolone). He started both that day. The prognosis was not good, I was absolutely terrified, and Remy just wasn’t acting like himself. We asked for a second opinion on Remy’s biopsy since it was an unusual diagnosis. The second opinion (from the same lab) came back as Feline Gastroinstestinal Eosinophilic Sclerosing Fibroplasia. 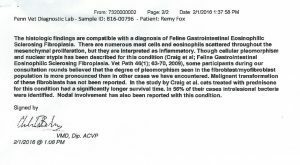 The oncologist had never heard of FGESF and sent me some studies she found on it, but there were very few and mostly conducted on cats that had already passed away. There was barely any information out there, and none at all regarding long-term prognosis. All I was told was that it was a very controversial disease with a “not very good survival rate.” After the second diagnosis was made, the pathologist that originally diagnosed the mast cell tumor (MCT) adamantly disagreed. As a result, every single pathologist in the lab had a meeting to determine an official diagnosis and after both pathologists presented their cases, a consensus could not be reached. I was so scared – my baby either had a very aggressive form of cancer or a disease that no one knew anything about! Naturally I insisted on a third opinion. I said “No more messing around, we are sending the sample to University of Pennsylvania,” which is very well-regarded veterinary institution. While waiting for the results, Remy was going to the oncologist every week to be weighed and have bloodwork and other tests. He was anemic and not gaining enough weight, and having trouble taking the prednisolone orally. The oncologist prescribed Cerenia, Pepcid and Mirtazapine, as well as ordering transdermal prednisolone to reduce the stress of forcing it orally. In the meantime, the oncologist was doing a bunch of research on FGESF and reaching out to many colleagues. There was just so little information out there, but after speaking with other veterinary professionals, she said she was leaning toward the FGESF diagnosis. The treatments for MCT and FGESF were different so we decided to wait to hear the third diagnosis. After a few weeks, we finally heard back from Penn and the diagnosis was FGESF. The Penn pathologist did not know what to recommend and was concerned because he wasn’t sure that the entire mass had been removed, citing that there were “unclean edges.” Based on this diagnosis, we decided not to move forward with the chemotherapy, but to continue with the prednisolone. According to the few studies on FGESF, prednisolone and antibiotics were the recommended treatment. From that day forward, I reached out to every author of any existing FGESF studies, feline veterinary specialists, feline veterinary organizations, surgeons, gastrointestinal specialists and anyone else I could find. No one knows the cause of the disease, the progression of it or how to treat it long-term as there is no documentation of cats living long-term with it. I also tried to find other folks whose cats were diagnosed with this illness. Over several months, I was able to find three other folks who had cats with FGESF. Every one of them had a different experience than Remy, and every one of them had a different understanding of what the disease was and how it acted. My understanding is that it’s basically an inflammatory response that lives in the cat and any time there is an inflammatory trigger in the GI tract, the white blood cells (eosinophils) rush to the area and a lesion is formed. The lesion is removed surgically most of the time, but sometimes surgery can be avoided if the prednisolone reduces the size of the lesion and if the underlying cause has resolved or is resolved. By March 2016, Remy was back to a normal weight and was no longer anemic. It is now November of 2017 and Remy is still on prednisolone (transdermally) which seems to be managing the inflammation. He seems to be doing great but I worry all the time. Every sigh he makes, anytime he throws up, I panic. He goes to the oncologist every 2–3 months for a complete exam, bloodwork and ultrasound, to make sure that there has been no recurrence of FGESF and that the prednisolone is not causing any harm. I’ve also been corresponding with Dr. Michael Linton (the author of the aforementioned study) on a regular basis. He is in Australia so he hasn’t been able to examine Remy in person, but has all of his medical records and test results. Dr. Linton’s medical advice has been invaluable, and he has been an amazing support system. Of course I also monitor Remy daily for behavioral and appetite changes. We’ve been concerned about possible long-term side effects from the steroid so we tried many things to help wean him off of it. As soon as we lowered the dosage, he started vomiting again. My mission was to find an anti-inflammatory diet for him which I was hoping would help reduce the inflammation, thereby making the prednisolone unnecessary. That is how I found the IBD Kitty page and its wonderful community! In the last year and a half, Remy has seen holistic veterinarians and veterinary nutritionists. Many things were recommended but were rejected by my sweet finicky kitty. We tried homemade food, bone broths, hydrolyzed foods, novel proteins, holistic tinctures and supplements; Remy would have none of it. The only thing we did not try was a raw diet which was advised against being that his gastrointestinal system is very fragile and he is susceptible to infection. So currently, Remy only eats Hill’s Prescription Diet i/d Dry Food which I know is frowned upon by many. We tried to switch dry foods several times but the doctors are so worried about disrupting his routine and upsetting his GI tract that they’ve all recommended that he stay on the same food. On occasion, Remy will lick the gravy from a canned food, but will not really eat any of it. The one thing that every doctor I have spoken with can agree on, is that it is more important for a cat to eat at all than to eat the “right food,” as unlike dogs, cats will starve themselves to death. I wanted to reach out to the IBD Kitty community because of the similarities in symptoms between IBD and FGESF. Because so few doctors are aware of FGESF, it is thought to be underdiagnosed. If your kitty has these symptoms and you can afford an x-ray or ultrasound, you may want to consider checking for a mass. It just breaks my heart to think that there may be cats out there that may have undiagnosed FGESF because the veterinary community knows so little about it at this point. If something doesn’t feel right, always push for a second opinion. That is what I did and it saved my baby boy’s life! I wish you and your sweet kitties all the best!